I truly feel like starting a blog has made me infinitely more aware, not only of my surroundings, but about my own ability to start and follow through with something. These are some things I've learned since starting a blog. You can never have too many notebooks : I've always been an extremely organized person and since starting blogging, that's been taken to a whole new level. I'm a list writer and having a blog means generating new ideas everywhere and about everything. It means planning out posts and thinking about photos. It means constantly looking for new places for pictures and always looking for new ways to express yourself. There is no way my brain would be able to remember all the things involved with blogging, hence the collection of notebooks. You become a professional writer, photographer, beauty (or fashion or food or sports, etc) expert and so on. I've always said I started a blog because I love to write. When I ventured into the world of blogging (quite clearly) I knew zero about photography. I still only have a five year old's grasp of what a good photo should look like, but it's a learning process and I'm continuing to discover new things all the time. Social Media awareness : I know nothing about social media. Admittedly, I should. I'm not so old that I should be this in the dark about technology, but to be honest, it's never really something I've been interested in. I've only barely started an Instagram account, and I'm still not even sure what it is I'm doing. Don't even mention Twitter or Facebook, those are scary realms in the depths of social media my brain doesn't even want to think about venturing into right now. Thinking things through : It's always been relatively easy for me to write, and I'm a person known for just spitting things out. While I get myself into trouble from time to time for speaking before I think, it's never been a problem for me as far as writing goes. Granted, I've only ever written for myself or my teachers, so this is a whole new territory. Having a blog has really made me think how I want my words to come across, what it is I really want to say and, maybe most importantly, how the things I'm saying might affect other people. It's definitely made me think a little bit more about what I want to say. New things can be good : I'm not known to be a risk taker, and as I've said in a previous post, this gets worse as I've gotten older. Starting a blog was something I'd thought about for so long, I didn't think I'd ever venture into making it a reality. Thankfully, a little bit of courage (and a lot of encouragement from a wonderful hubby) helped me realize my goal. And since I've started blogging, there isn't one day I've looked back and thought "man I wish I wouldn't have done this!" It's been such a fun learning experience and one I'm truly grateful to have started. Obviously this list could go on for miles, and I may do updated lists from time to time as my knowledge for all things blogging grows, but in the meantime, tell me what you've learned since starting a blog! Great post, Kim! 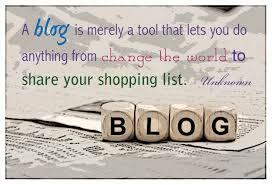 I have learned so much in my short time blogging and constantly continue to do so. Starting a blog has been such a positive experience for me and I love to keep learning about it. Keep up the great work, I always look forward to your posts! This is such a great post Kim! I especially agree with you about learning new things. I am learning quite a bit about photography and social media through blogging. Don't worry, I'm also totally in the dark about Facebook, Twitter and Instagram!